The Soviets started to field fuel tankers (petrol bowsers to the Commonwealth) in the 1930s and had several designs of light and medium tankers. But fuel was always a constraint and thus the more the better. Mirror Models is a recent addition to the modeling world and the first one to my mind from Ireland to make 1/35 scale kits. They have jumped into the void left by a lack of US and Commonwealth vehicles as well some lighter Soviet ones like the Komsomolets tractor. 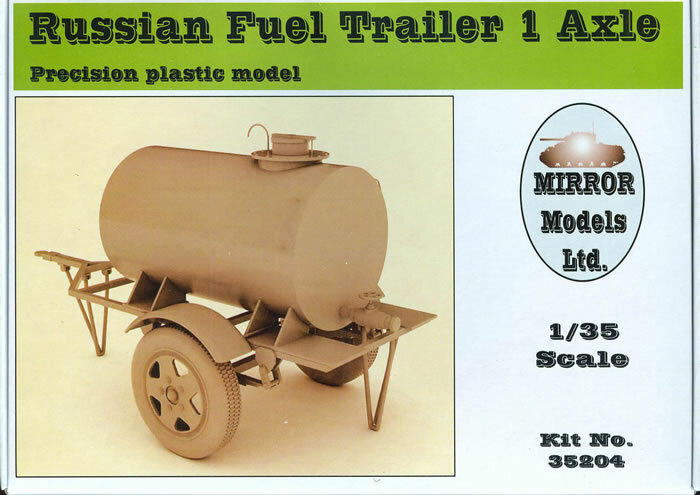 This kit replicates a simple 300 liter trailer which can be used for either fuel or water, but the latter was usually not considered a problem to the Soviets. It comes with a spigot at the rear of the tank but no hoses for use in fueling vehicles. Construction is relatively straightforward and as it is a simple kit so are the directions. The most complex part of the build is wrapping the spring mounts over the axle and springs using the length of wire provided but more experienced modelers may wish to replace it with fine styrene rod and sprue as well as add strip carrier plates and NBW castings. The kit does provide the carrier plates (Parts D18) for those who use the wire method. The trailer does come with front and rear landing gear so it may be shown on the front as sitting or on both when in use. The trailer is proper for use with just about any Soviet truck such as the light GAZ-AA and GAZ-AAA ones or the bigger ZIS-5/ZIS-6 or Studebaker US6 and also the Komsomolets. No decals are included and the directions indicate it is painted overall dark green (e.g. 4BO) and the tires are black. I expect it would have some sort of registration number on it but have not seen a good photo of one to determine what they would look like. Overall this is a nice little kit and while seemingly expensive it is styrene and much easier to deal with and modify than a resin kit.